Getting married is an exciting time and it’s important to appreciate every moment of it. However, some corporate, business-minded couples barely have time for themselves with long stressful working hours and a very busy lifestyle to make the most of their big day. Is this you? Well, now you no longer have to be! Today’s digital world enables couples to not only plan their wedding from the tips of their fingers but also choose gifts for their wedding at their own comfort. And this is now a possibility thanks to wedding registries. Wedding registries and the etiquettes of gifting has been a hazy subject full of many questions from either party: the givers are stuck on what to gift, how much to gift and when is it appropriate to gift. The receivers, on the other side, wonder whether it is acceptable to ask for cash. Needless to say, there are many cultural beliefs and differences that can determine the outsets of these questions. So we have come up with a handy guide for you to understand the concept of e-gifting and the easy usage of wedding registries, whether you’re the one getting married or a guest!. Our number one advice for a couple is to be honest and to communicate. While many may think that asking for what one wants is tantamount to shameless greed, we are of the modern mentality that is it in fact very thoughtful of a couple to be open about their needs, and by expressing themselves truly, they are actually being courteous to their guests. The art of “asking for what you want” is a subtle one; the hardest part is the wording of it. We suggest you make a list of the things you would to receive – whether actual items as gifts or cash – and phrase your request letter in a polite, delicate yet clear manner. The next step is to decide on your wedding registry. This is crucial because one little mistake on behalf of the company and both parties suffer from embarrassment. This is where we come in: the Wedding Registry at YouGotaGift.com. It is a modern way of gifting couples rather than the traditional classic wedding registry. It is subtle, easy-to-use and very practical, so even when a couple feels uncomfortable creating an online wedding registry, the Wedding Registry at yougotagift.com ensures you that couples are not being selfish by asking for what they want, but rather easing the process for themselves as well as their guests. Let’s not forget, guests are going to get you gifts regardless, so why not ensure they are gifts that you really want? One major tip for eloquently asking for cash from your guests is by linking your wedding registry gift experience behind the guest’s cash contribution. Most couples getting married today are looking for flexible gift options to avoid receiving unwanted gifts. With the digital age it is now possible to be more creative and tasteful to ask for gifts from your loved ones by removing the traditional taboo on cash gifting that some people might feel is not appropriate. You can now invite guests from all over the world to contribute without the hassle of visiting a store or carrying money in an envelope. This is what the Wedding Registry at YouGotaGift is all about! It’s convenient for both the couples getting married and guests alike. How? By not only providing gift vouchers, but also giving guests the option of gifting cash! 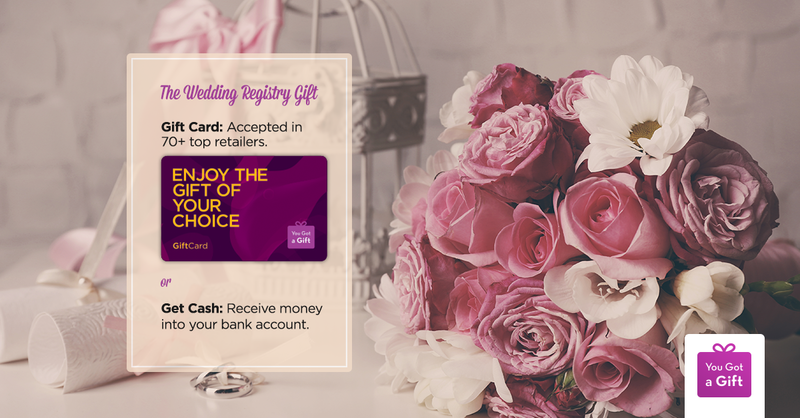 Guests can contribute to your wedding registry by gifting cash towards your Gift Card where couples can choose their gift from over 70 top retailers. Furthermore, couples can cash out the money by transferring it to their bank account to save for their ultimate honeymoon destination, their new home furniture, their future… anything! Newlyweds choosing the Wedding Registry at yougotagift.com have the option to get gifts from Crate & Barrel, Vileroy & Boch, Marina Home, Jashanmal, E-Max and more by choosing, for example, Mall of the Emirates Gift Card, when closing their wedding registry account. Other Gift Cards are also available, such as Virgin, Arabian Adventures and more. When it comes to guests, we want to address the ultimate sensitive issue of how much cash they must feel is appropriate to gift. A key tip here is that the guest must understand that there is no right or wrong amount! Any amount that guests contribute to your Gift Card is good enough. After all, it is the ultimate experience revolving around gifting that is the most important. In a nutshell, we want to reiterate how important be honest about what you want to receive and what you want to gift. It is a subtle art that plays with many people’s sensitivities so it is of utmost important that you sign up to a reliable and fun wedding registry that takes care of all your needs – whether you are the newlywed couple or a guest at their wedding. With our services, couples and guests both can enjoy the experience with just a few clicks by ensuring that guests are sending the right gift in the form of cash and couples are receiving gifts that they have always wanted in a hassle-free, simple, and enjoyable way. 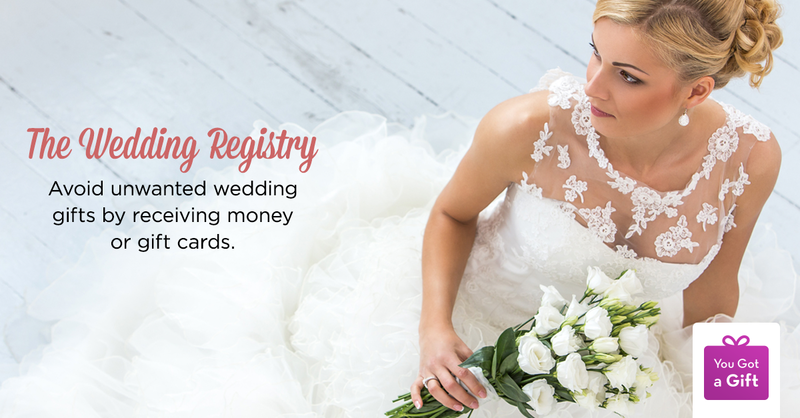 Visit the Wedding Registry page to learn more about setting up your wedding registry account!